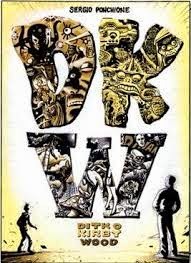 Fantagraphics just released a one-shot by Sergio Ponchione called "DKW". This stands for the infamous Diko, Kirby and Wood. Three prolific comic book artists who led rather strange lives. An aspiring comic book artist gets a lesson in the greats and by reading this book so do you. Ponchione tells a brief story of each of the three using their own unique artistic style. I feel that Ponchione did a good representation of what each artist contributed to the world of comics while emulating their unique style. I felt as though his imitation of Ditko was a bit off and more of Ponchione could be seen in the picture than Ditko. However, the opening with the letter "D" was the most accurate stylistically. You can see the panel I'm speaking about below. But check out that outrages cover and look really closely at each letter. I think you will find it pretty amusing. In short however, this single gives a nice little insight into the lives of three important figures in comic book history. 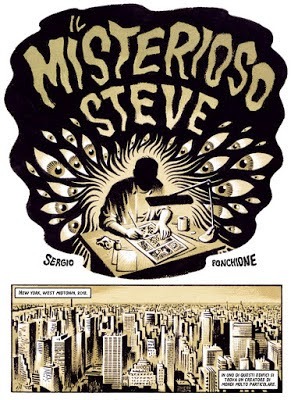 For a little background on our author, Sergio Ponchione has been published by Fantagraphics since the 1990's. His other known works include the contributions to the various artists series Mome and his own title Grotesque.